The neat thing about compilation books from multiple authors is that you're likely to get the best of the best. 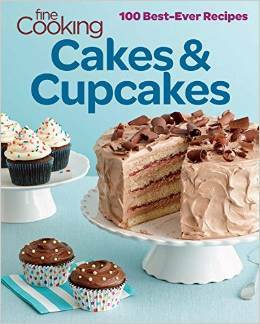 Fine Cooking Cakes and Cupcakes has recipes from a whole lot of cookbook authors, with delicious cakes, cupcakes, frostings, fillings, and more. There's a pineapple crumble snack cake from Flo Braker, ginger cupcakes from Greg Patent, and a crumb cake from Abby Dodge, a lemon icebox cake from Rose Levey Berenbaum, and a cinnamon-caramel-ganache layer cake from Alice Medrich, among others. Recipes range from simple to complicated, from homey to fancy, and from vanilla to dark chocolate. There's something for everyone. I received a digital edition, and it had some glitches in formatting, but it wasn't anything that affected the ability to make any of the recipes. There were some sections of text that were light yellow that made them pretty much unreadable in normal mode, but changing the settings in my reader made them visible. Don't you love technology? To be perfectly honest, I prefer print cookbooks over digital versions, even when they're perfectly formatted. This book has plenty of photos to entice you, along with a few process photos for some of the techniques. Overall, it's a good selection of what should be very solid recipes. I've only made one recipe so far, but I've got a whole lot of them bookmarked. Some will have to wait for an event when I need a layer cake, but I'm sure I'll get to all of them eventually. If you're looking for a good, all-around baking book for cakes, take a look at this one. I received a digital version of this book at no cost to me.